I was so gratified when this dragonfly turned up in the garden. The sight of it gave me a great sense of achievement. For this year we renovated the tiny but charmingly overgrown garden that came with the house when we moved in last year. Measurements were taken, plans drawn, garden waste and rubbish was taken away either by lorry, or by ourselves in numerous trips to the local waste tip. An old shed was taken away. A new workshop arrived. A new boundary fence put in place. Four raised beds were set up using sleepers. Paths were dug out and gravelled. Trellis was erected. An arbour with a seat was set in place. Excess topsoil went away in two lorryloads, the new beds dug over, improved and nourished. Shrubs, plants and bulbs planted. I painted the new workshop willow green with cream accents. Hung some white lace curtains with a tulip design. A sentry box garden tools store was attached – it looks like a little gable – and painted green, cream and lavender. The arbour, a wooden garden bench and a small shelf unit for displaying plants was painted to co-ordinate. And then one hot day, the air full of the scent of lavender and assorted herbs and busy with bees birds and butterflies, the dragonfly came. And posed and stayed for ever so long. The garden is a success. I’ve started some paintings (acrylic) already. 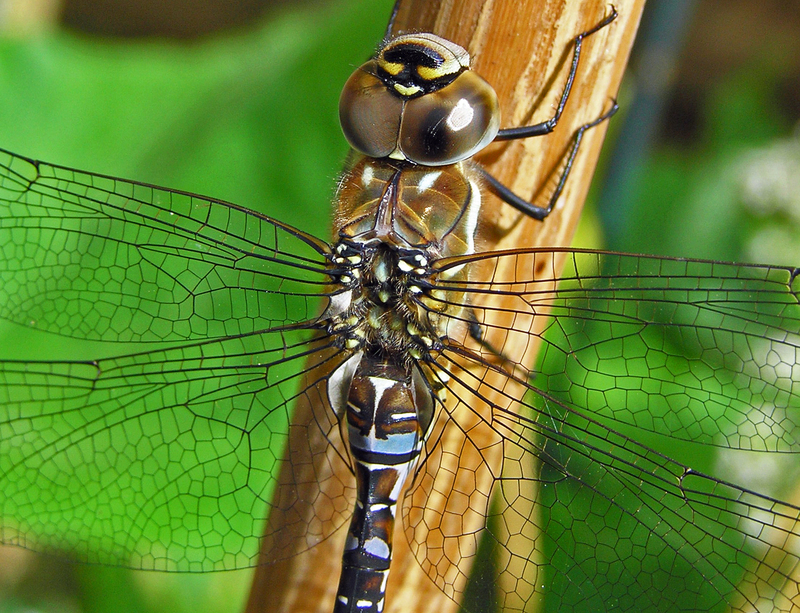 Just look at the design and engineering of the dragonfly! By comparison, my garden design is childish and clumsy. Does anyone know the name of this dragonfly? This entry was posted in Art, Photography and tagged Dragonfly, Fauna, garden, Garden tool, Home and Garden. Bookmark the permalink. Thank you. So are you! Ann (who would probably have been Granny Ann had she had any children).